We continue our Rhythm Incursions and Turntable Radio Japan special with week 2 of exclusive audio from Ken One’s Skratch Evolution 2 event, held in Kichijoji, Tokyo in December 09. If you missed part 1 check it here. This week we have DJ Duct on Rhythm Incursions, and Naoki over at Turntable Radio. Full schedule for the special, which runs over 4 weeks, is at the bottom of the post. DJ Duct is a Tokyo turntablist and producer who I first came across a few years ago thanks to Waxfactor and our common obsession with underground Japanese music. When I lived in Tokyo, Ken One introduced me to more of his work and his rather famous live sets performed solely with one turntable and a loop station and effect units. His are no standard turntablist loopstation sets though, the man rocks party sets and the likes with just one turntable reconstructing audio on the fly. The only other person I’ve seen do this on a similar level of both detail and skill is Tayone, who does it using Serato’s Scratch Live. DJ DUCT’s ‘less is more’ approach to turntablism has led him to establish his current unique style of performing. Using one turntable, a DJ mixer, a sampler, Kaoss-pads and other effectors, he collages and reconstructs the bits and pieces of sounds he captures from the records on the spot. It involves a lot of sampling, real-time editing, effect mixing and scratching all taking place on stage. Since all the sounds come from the records (and no preliminary recorded materials on the sampler), it’s definitely a live performance, and an extension of DJing more than anything else. 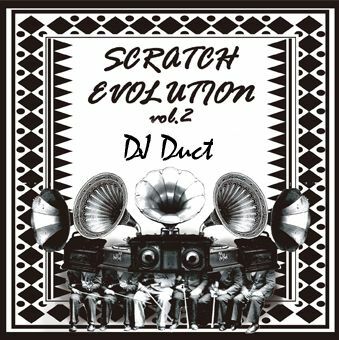 Being a fan and friend of his, Ken One invited Duct to perform at Skratch Evolution 2, the audio of which we’re putting out today for everyone to discover and enjoy. It’s a rather short set, just under 30 minutes but with plenty going on in that time with classics and newer tracks from across the musical spectrum chopped up and looped in fine style. If you like what you hear be sure to come back for the last week of our SE2 special when we’ll be podcasting the SE2 mix CD which features Ken One and Duct. More information on Duct is available at the myspace, alongside links to his releases on labels like Think Rec and Lybrus Music, two of Japan’s most interesting indie labels. For now though sit back and enjoy 30 minutes of one of Japan’s finest DJs and best kept secret. And don’t forget to check Turntable Radio for more SE2 action which this week features a live set from Naoki, undoubtedly one of the most talented and interesting turntablist from Japan’s new generation. This entry was posted on Sunday, January 31st, 2010 at 5:01 pm. It is filed under Podcasts, Guest Mixes and tagged with Japan, Skratch Evolution, Tokyo, DJ Duct. You can follow any responses to this entry through the RSS 2.0 feed.